Oskar 75 self-supporting stainless fume extraction arm ais designed to suit many types of dust, fume and smoke applications. Oskar 75 extraction arm construction means all adjustments and supports on the outside. 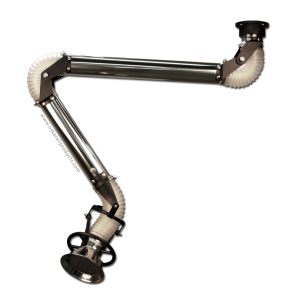 Oskar fume arm duct is free from any internal mechanisms (except for air flow damper). Oskar 75 arm is easy to position and simple to maintain. Smooth metal tubes and outside joint construction provide lowest pressure drop, low noise level as well as remarkably long operational life time. There is no need to stop exhaust system or touch polluted air stream to adjust the arm. Wide choice of different flexible hoses and arm construction elements options allow to customize Oskar stainless arm to work with many air pollution applications (antistatic, ATEX, chemical, high temperature, clean rooms, food, pharmaceutical and more).